The Buick Regal's back and with stellar styling and the promise of a manual transmission, it's trying to prove GM's serious about making the blue-haired brand appealing to whipper-snappers. We drove it yesterday and frankly, it's pretty good. It's November in Michigan, and that means it's cold and dreary and dark, not the most appealing time to be out driving, but when GM tosses us the keys to it's latest Buick we actually felt a twinge of excitement. Over a Buick. This shouldn't come as a surprise to anyone who's seen the accolades piled atop the Regal's twin the Opel/Vauxhall Insignia. Combined the two identical cars have racked up over thirty awards across Europe and have managed to claim top-seller status. This is where you replay the last twenty years of General Motors history and put on your skeptic's hat. 'They'll decontent the car, turn the suspension into a squishy mess, the seats will be made of muppet soft cloth and the steering will feel like it's connected to the road through a damp rope.' This is a supposition any healthy car consumer should have, especially regarding a Buick made from an Opel. On all counts however, you'd be wrong. The Regal in the US is different than the Korean market version in tuning only, it shares 95% of it's parts with the Insignia. Basically the changes come down to different headlights and tail lights per federal requirements, new software in the radio and navigation system, different rear view mirror glass, and all-season tires. They actually improved over the Insignia's NVH requirements, adding sound deadening material in the cabin to make it align with Buick targets. We drove the European spec Insignia against the Regal and believe it or not, the Regal is better. We drove Regals equipped with the 2.0 liter turbocharged inline four with both the six-speed automatic and the manual six speed. Off the line the car pulls hard with both the manual and the auto, squealing the tires through first, making use of all 220 HP and 258 lb-ft of torque on the way to a mid-seven second 0-60 MPH time. The transmissions are pretty respectable too, the manual shifts crisply and the engagement point is smooth, gears are well placed to work with the slightly heady engine and spirited driving is downright fun. The six speed auto isn't anything to sneeze at either, passing is a remarkably swift endeavor, it kicks down and away you go, pulling like a mule all the way. Steering under normal and spirited driving has an excellent on-center feel the thick-rimmed tiller has just the right weighty feel under turn-in and the car stays flat through hard sweepers. Potholes and heaves are soaked up though don't completely disappear, the car is tuned fairly stiff for a sporty communicative feel. If there's one thing we can fault in the Regal, it's the steering under hard acceleration, there is a tendency for the wheel to get light and darty, while it's not nightmarish vintage Saab-like torque steer, it's the one thing that could use improvement in the car. Did you catch that? One thing. Everything about the car is solid, it feels overwhelmingly Germanic in nature. The build quality of the interior is on-par with modern VW's, the seats even look and feel like something out of Germany — firm, supportive, well bolstered and extraordinarily comfortable, they even have extending thigh supports. The leather is extremely high-quality but the cloth seats are nothing to sneeze at either. Buttons have a satisfying damped click, knobs are detented just right. The gauges are clear and communicative and the info center works without complaint. The car comes with all the latest gadgets like Bluetooth, satellite radio, navigation, and other widgets people seem to like. The entire layout is sculptural and quite handsome, though like the Buick LaCrosse, the sculpture results in storage that's somewhat lacking. 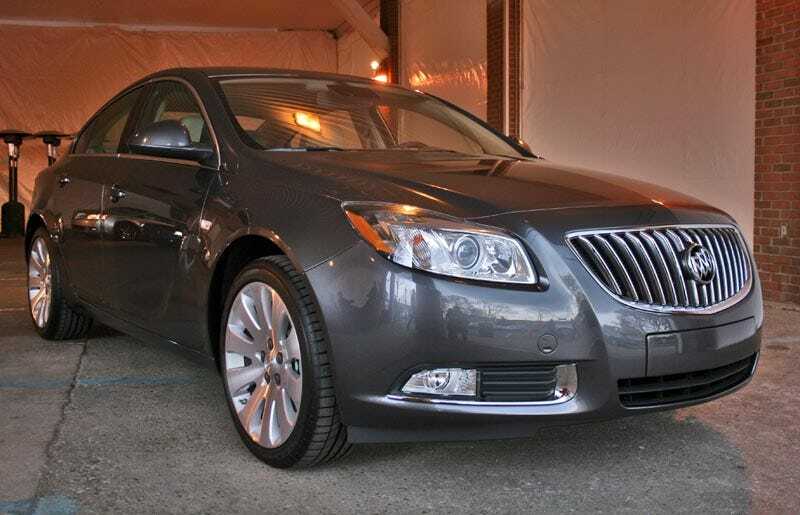 So let's see what we have here; A gorgeous, fun-to-drive, quick, comfortable, well-equipped American sedan built with the quality of its German competitors... and it's a Buick. Who knew?